Free Wi-Fi low-priced rooms and HP Pavilion less than half a mile away are provided by Motel 6 San Jose Convention Center to our guests who also get free parking. 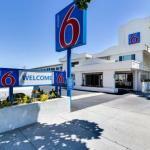 The Motel 6 has 65 rooms in a two-floor building with exterior corridors and no elevator. Rooms feature free Wi-Fi minifridges and expanded cable TV. Non-smoking rooms are available. The hotel also has a laundry facility lobby coffee 24-hour front desk and free parking. One pet per room is allowed with no fee. The Motel 6 is on The Alameda in downtown San Jose. Watch the Sharks skate at HP Pavilion which is walking distance (less than half a mile east) from the hotel. The Tech Museum and San Jose Convention Center are one mile east and Winchester Mystery House is three miles southwest. If you're driving from Norman Y. Mineta San Jose International Airport the hotel is four miles south.